Rory McIlroy’s putting was about as miserable as the weather as he played yet another Tour supporting role and this time in the rain-affected BMW Championship in Philadelphia. 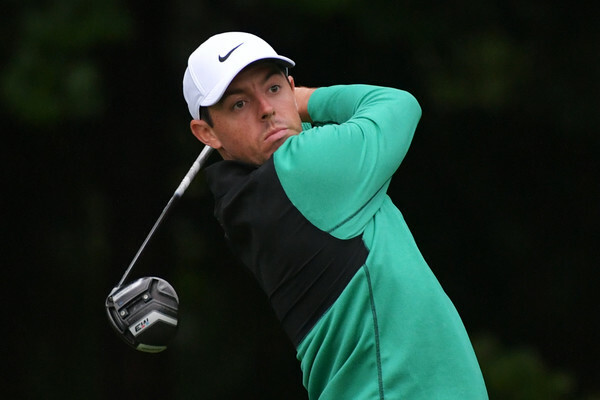 McIlroy saw hopes of a second Tour victory sink with a final round 68 for an 18-under par tally for fifth place on the very water-logged Aronimink course. Fellow PGA Champion, Keegan Bradley ended a six-year winless drought sealing victory at the first extra play-off. Bradley, 32 denied England’s Justin Rose but who still moved to become the new World No. 1, after both players completed regulation play tied at 20-under par. Rory McIlroy dons ‘Emerald Green’ for the final round of the 2018 BMW Championship. Bradley had led by a shot playing the last but sent his second into a grandstand from where he took bogey only for Rose to birdie 17 and go one clear of his American rival. But Rose then did the unimaginable in also bogeying the 72nd hole of to send the event into a play-off. From the outset, nothing went well for McIlroy and despite choosing an Emerald green rain-proof top for the third Monday finish this year on the Tour. He started the round sharing second place on 16-under par but proceeded to miss the opening two fairways and before long he was on a run of pars while all around where making birdies. Indeed, McIlroy made the turn after nine agonising pars. McIlroy had a number or birdie chances but those he missed for birdie failed to even hit the hole. He got a good break at the uphill par-5 ninth hole with his fairway wood bounding off a back green grandstand and with his ball landing back on the fringe of the green from where he two-putted for round and a 9-hole effort of 16 putts. Finally, made his presence known landing his second shot at the downhill 10th to just a foot for a first birdie since late on Saturday afternoon. McIlroy got no momentum from the birdie by parring his next five holes before just the second birdie of his round at the par-5 16th. He then pared the remaining two holes for what is a seventh Tour top-10 this year and with his lone success, the Arnold Palmer Invitational. And McIlroy was not intent on hanging around avoiding nearby youngsters calling for McIlroy’s autograph as he blanked everyone in making a bee-line to the locker room. His driving should not be a concern as he hit 41 of 56 Aronimink fairways over the four rounds but on the two days he struggled with the putter needing 32 putts first in taking a second 69 and then the same number of putts over his final day 68. In Thursday’s share of the lead 62, McIlroy used the putter on just 27 occasions. The only good news is McIlroy moves from 24th to 17th on the FedEx Cup points table ahead of the 20th September starting Tour Championship in Atlanta. Also he’s jumped two places to return to World No. 6.